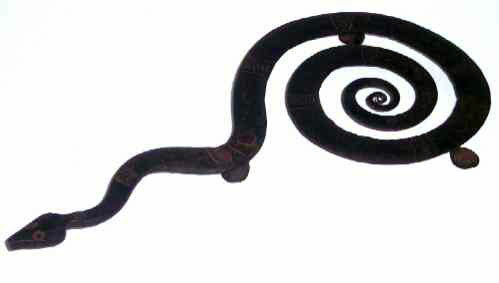 Presented here, a wrought iron trivet shaped like a snake, elevated on three penny feet. Dating from the 18th century, this is a superb example of the art of the blacksmith with it's marvelous form and incised decoration. The trivet measures 13" long and is 6-1/3" in diameter. The condition is high outstanding and as Folk Art it just doesn't get much better than this. The pictures do not do this piece justice in showing the wonderful detail in the ironwork. There are 18 chisel engraved bands that consist of two boundries that go across the snake's body and have arcs chiseled between the bands. Fine original surface with only some minor surface rust. 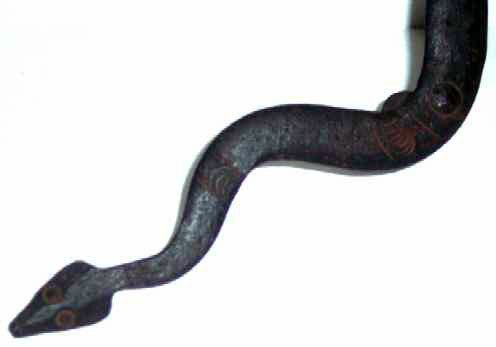 Obviously made by a very talented blacksmith who elevated this utilitarian item to an art form that fortunately for us survives over centuries for us to admire and, yes, still use as it was originally intended.